JAMESTOWN – Your heating bill isn’t the only thing that’s feeling the effects from this winter’s exceptionally cold temperatures. Miles upon miles of streets and highways throughout Chautauqua County have been battered by municipal snow plows, tons of road salt, at times heavy rains and the constant freezing and thawing temperatures. Together, the combination has resulted in some of the worst pothole conditions the area has seen in years. In Jamestown, it’s become difficult to drive down any main route without having to navigate at least one major pothole. Elsewhere, the roads have gotten so bad that nearly all the surface pavement has been striped, leaving a rough surface that can batter and damage a vehicle’s suspension. Due to the cold temperatures we’ve experienced the past several weeks, there isn’t much the city road crews can do. 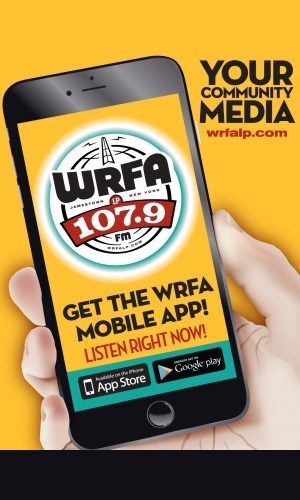 Department of Public Works Director Jeff Lehman told WRFA on Monday that his crews can only do so much until the warm weather finally arrives. 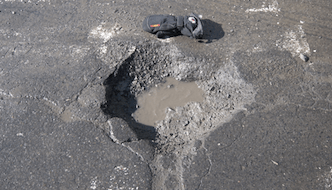 Some local motorists have reported experiencing damages to their vehicles due to road conditions, but according to Dolce, the city doesn’t automatically assume responsibility for damages that may have been caused by rough roads. Any resident or motorist who wishes to notify the city of an especially damaged or dangerous roadway should contact the Jamestown Department of Public Works during regular business hours.